It was December. It had been nearly 2 months since I first stepped foot in the US. The house smelled sweet...of chocolate, no cookies. Both. Curious to see what it was, I walked downstairs, timidly passing several members of my new family. It was odd being in that space. A large, red brick house in a tiny town that held no memories and felt nothing like home. Yes, it's true, I had my own room, which I never envisioned could be possible, but it was foreign. The whole thing felt like a strange dream from which I was sure to wake up any minute. By that point, I had 2 months to process the fact that I wasn't in Romania anymore. I had experience leaving home the first time we moved to Germany but it was nothing like this. My father still in Europe, my mom, brother and me living with my new step-family. I'd learned that day that that it was customary to make cookies around Christmas time. Though I have few pleasant memories from that first Christmas, that one stuck with me. Those cookies were one of the best things I'd ever eaten. The taste confused me. Chocolate and raspberry together? It was a peculiar combination to me at the time. For years I had no idea what they were called. I craved them and wanted them but there is just no way to find out what something is when you don't even have a name for it. However sometime around the 2000s when Google was born, I was able to slowly piece together that which I thought I'd never find. The name of these cookies. To this day I wonder, is it the name? The strange memories associated with them or is it the fact that they were this elusive mystery which I couldn't solve for years that drew me to them. As I no longer eat the majority of ingredients that go into making traditional thumbprint cookies, I've had to come up with alternatives. 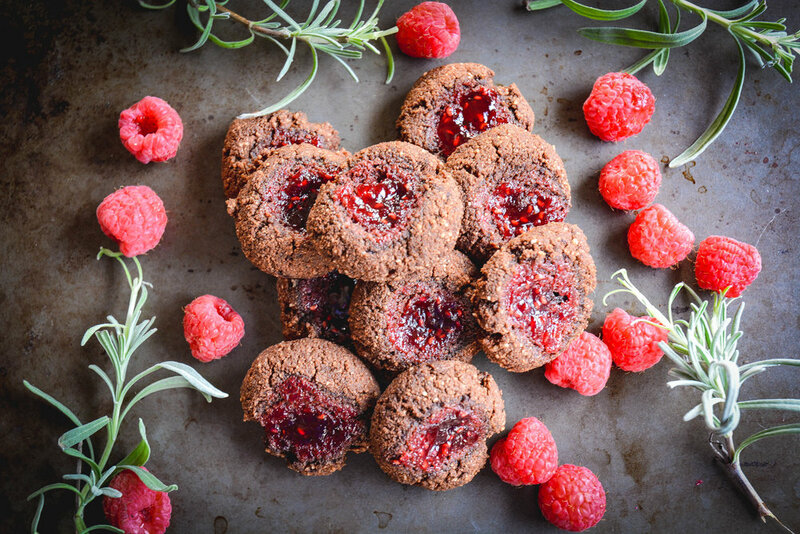 So I give you my version of grain free, gluten free and dairy free thumbprint cookies. Preheat oven to 350 degrees. Combine all ingredients in mixing bowl. Whisk until everything is fully incorporated. Line baking sheet with parchment paper. Next take a small amount of dough and form into a 1" ball. Place on parchment paper lined sheet and press your thumb in the center to create a little indent. Repeat until all the dough is gone. Place roughly 1/4 tsp of raspberry jam into thumb print. Bake the first tray on middle rack for 10 minutes. Repeat with the second batch. * I highly recommend using dutched chocolate otherwise your cookies will end up with a cake like consistency. 1. Preheat oven to 350 degrees. Combine all ingredients in mixing bowl. Whisk until everything is fully incorporated. Line baking sheet with parchment paper. 2. Next take a small amount of dough and form into a 1" ball. Place on parchment paper lined sheet and press your thumb in the center to create a little indent. Repeat until all the dough is gone. 3. Place roughly 1/4 tsp of raspberry jam into thumb print. Bake the first tray on middle rack for 10 minutes. Repeat with the second batch. 4. Cool completely and store in an air-tight container. Please don't forget to SUBSCRIBE and stay in touch on the latest recipes and blog posts!